Royal Caribbean’s latest cruise ship Anthem of the Seas arrived in Southampton earlier this morning. Anthem of the Seas is the second Quantum-class ship in the Royal Caribbean fleet and will home-port in Southampton for the summer 2015 season, replacing Independence of the Seas for just one season. Royal Caribbean has dubbed the Quantum-class of ships as “smart ships” due to their technological advancements. The ship offers a number of innovations including Virtual Balconies in inside cabins, robotic bartenders, high-speed internet access, indoor skydiving at sea, robotic screens at Two70, and their versatile SeaPlex space which offers circus skills training, roller skating, basketball and dodgems. 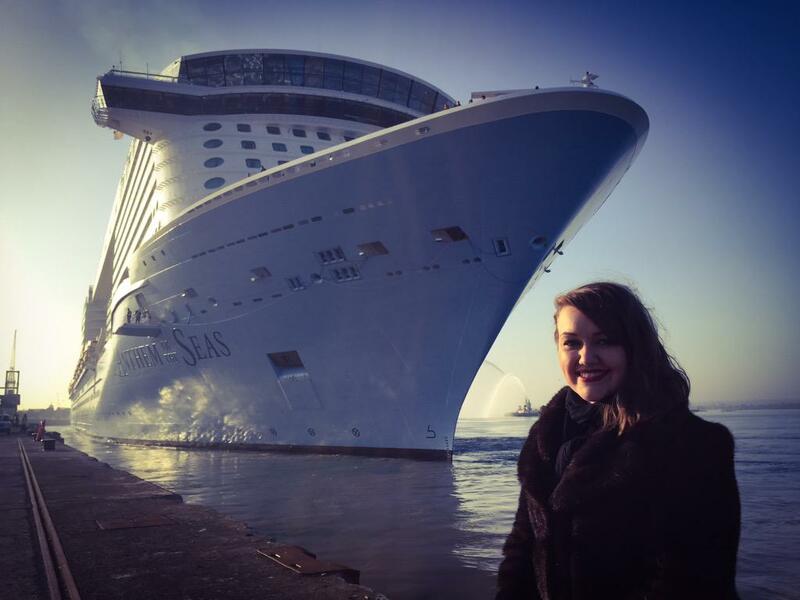 The ship’s Godmother will be travel agent Emma Wilby who won a Royal Caribbean competition to find a young, talented star from within the travel industry. She will officially name the ship on 20 April. Anthem of the Seas will sail on two pre-inaugural cruises for members of the press and for travel agents before departing on her maiden eight-night voyage on 22 April. Her first public itinerary will call at Vigo, Spain; Gijon, Spain; Bilbao, Spain; and Le Havre (for Paris), France. Royal Caribbean expects more than 80,000 passengers to sail on the ship while she is home-ported in Southampton which they expect will bring £50 million to the local economy. Royal Caribbean also announced today that Ovation of the Seas, the third Quantum-class ship in the fleet, will home-port in Sydney, Australia, for the winter 2016-17 season following being home-ported in Tianjin, China, for its inaugural season. The ship will be the largest cruise ship to have ever home-ported in Australia. Ovation of the Seas will be the fifth Royal Caribbean ship to home-port in the region for winter 2016-17, joining Voyager of the Seas, Explorer of the Seas and Radiance of the Seas in Sydney and Legend of the Seas in Brisbane.